Sciatica. Sciatica relief. Sciatica stretches. How to solve sciatica. These are questions that I get almost every day and the interesting thing is sciatica is not a real thing. Sciatica just means that your pain is travelling generally from the back down the leg. Often sciatica is attributed to a bulging disc, or herniated disc, or spinal stenosis or some other structural abnormality that is said to cause your sciatica. But the thing is, sciatica isn’t a problem on its own, but these other structural abnormalities, bulging disc, herniated disc, spinal stenosis, etc. – they’re almost never the cause of pain. Therefore if they’re not the cause of pain, they can’t be the cause of your sciatica. As a matter of fact, 2 out of 3 people that have never had back pain or leg pain have bulging discs, herniated discs, spinal stenosis – yet they’ve never had pain. These are studies that have been replicated over and over again and published New England Journal of Medicine. Really great studies. So what does that mean for you? 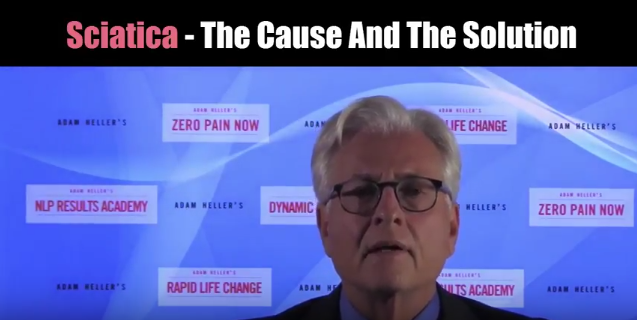 What it means is, if you’re trying to treat your sciatica, to try to get some sciatica relief, some pain relief, some sleep, some of all the other things that go with that – chances are if you’re using surgery, or using dangerous drugs, or chiropractic, or physical therapy, all you’re doing is treating a symptom which is probably giving you a little bit of temporary relief then the pain comes back again and again. That will happen forever if you keep doing pain management. If you keep managing the symptom instead of eliminating the cause, once and for all. At Zero Pain Now, there’s a reason that, in a recent Mayo Clinic pilot, every single person they sent got better and their cases closed within 28 days. There’s a reason that’s consistent with over 1100 prior cases at Zero Pain Now. Because what we do is help you eliminate the cause rather than manage your pain day in and day out. How can you find out if you can get better? That is the easy part, and it’s scientific, and it’s objective and you’ll know for sure. If you go to zeropainnow.com and you take the Pain Test, you will know objectively, with 97% certainty whether or not you’ll be able to end your pain once and for all. If not -not, but if so – there’s a really good chance for you. So I would suggest you go over there and do that now. Maybe there really is some hope. If you have questions, send them to me, adam@adamheller.com. I’ll answer them. In the meantime, take the Pain Test.